Throughout my years of working in the field, I have seen many types of “blunders” in vapor removal systems. I have seen suction points not properly sealed, oversized systems, grossly undersized systems and plenty of energy loss mistakes. The one mistake that always seems to make me stop dead in my tracks is when I come upon a previously installed system where the fan assembly is located indoors. This sight reminds me of the one undisputed truth which is “All fan motors will leak air eventually.” It’s that simple. When you are paying someone to rid your space of unsafe vapors… why would you want them to place the fan motor inside your building? As the system ages and the fan begins to leak air, you are expelling the hazardous vapors right back into the building, quite often making the problem worse than before the system was installed. All SSD system piping inside a building should be on the negative pressure side of the fan, ensuring that any possible leak will only bring fresh air into the system. A system with this design will prohibit unsafe vapors contaminating your breathable air as a result of air leakage. Fan motor designs have made many technological advancements over the last several years. These new motors can produce 50 inches of water column for less than 350 electrical watts. This means that the new fan motors will work exponentially better for a fraction of the monthly operating cost. These new motors are smaller, self contained, weatherproof products. They can easily be mounted directly to the exterior of buildings. They also come with warranties up to 5 years insuring peace of mind to the building owners. Fan companies are providing a vast product catalogue that enables the VOC specialist to choose the fan motor specific to the needs of the individual customer. 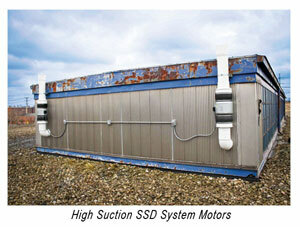 The newest SSD fan technology available is far superior to the traditional SVE system. However, this technology requires experience and knowledge to apply it correctly to each situation. Many vapor removal companies claim to have the equipment but have very little understanding of how to apply it. The process of vapor removal is both scientific and complex. It should be taken on as a partnership between the environmental engineer and the vapor removal specialist. If you do the leg work upfront and make sure you have a trained, experienced and well qualified professional handling your vapor removal you will save your client a great deal of time, money and headaches down the road self contained, weatherproof products. They can easily be mounted directly to the exterior of buildings. They also come with warranties up to 5 years insuring peace of mind to the building owners. Fan companies are providing a vast product catalogue that enables the VOC specialist to choose the fan motor specific to the needs of the individual customer.